About 60 kilometres from Khimsar, stand the exquisite temples of Osian in the midst of a small township. An important trade centre for Jains between eighth century and twelfth century AD, Osian has been reduced to being a place of pilgrimage and temporary stop-over for travellers enroute to Jaisalmer. 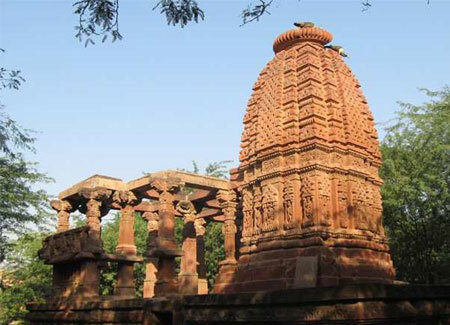 The temples of Osian are among the earliest of all the medieval temples in Rajasthan. Situated on the outskirts of Jaisalmer, eleven of the temples date back to the eighth century AD and are more like miniature shrines — some rising only eight feet in height. The remaining lot date back to the twelfth century and stand in a cluster on a hillock on the eastern side. Osian is said to have been founded by Utpaladeva, a Rajput Prince belonging to the Pratihara Dynasty. In those times, the city was known as ‘Ukesha’ or Upkeshapur.’ The temples of Osian, which are believed to have comprised the major religious and cultural centre of the Mewar kingdom, have suffered the ravages of time. However, it is fortunate that we can glimpse the exquisite handiwork of the artisans of that time, through this precious royal legacy of that period. Among the many intricately carved, red sandstone edifices, three are dedicated to Harihara — symbolically the union of Vishnu and Shiva. Built on a raised platform, they are considered to be some of the finest examples of temple architecture, owing to the profuse and intricate carvings that adorn their walls and pillars, beginning at the base and continuing up to the pinnacle of the spires (known as Shikharas). The Sachiya Mata Temple is said to have been built in two phases. The initial structure was built in the eighth century while the present temple dates back to the twelfth century. Dedicated to Sachi Mata (also known as Indrani) wife of Lord Indra (the Rain God), one can appreciate the importance of prayers at this temple, located on the outskirts of the Thar Desert. The temple complex has two other shrines dedicated to Chandi Devi and Amba Devi respectively. Having been built in many phases, this temple can be entered through a series of beautifully sculpted arches. Its interiors are decorated with images from the Hindu Pantheon. This includes an image of Varaha (an incarnation of Lord Vishnu) and a splendid image Lord Vishnu and Lakshmi. Among the older temples is the one dedicated to Lord Surya, the Sun God. It dates back to the 10th century AD and is perhaps the most graceful structure in Osian. The human figures engraved on it include those of Gods and Goddesses that are reminiscent of the languid grace in the carvings of Khajuraho and the Sun Temple at Konark. The sanctum comprises of a striking idol of Lord Surya, while the main hall has idols of Lord Ganesha and Goddess Durga, while the ceiling is festooned with the images of serpents coiled around leaves and flowers. The Mahavira Temple built by the Prathara King Vatsa, dates back to 783 AD. It is by far, the most magnificent among the Jain group of temples built during the eighth century, is celebrated for its stunning architecture. The main shrine with the image of lord Mahavira, is built on a high platform made of sandstone. The door to the sanctum is carved with a bevy of young maidens, while intricately carved pillars adorn the site of the main porch. The Mandap (pavilion) with its pillars and convex ceiling is ornately decorated with exquisite figures, carved much after the figures in the pavilion built earlier. The pavilions open on to a huge hall, with 30 gracefully decorated pillars. These halls were used for large gatherings such as cultural programmes, community meetings, etc. The floral patterns on the pillars convey great simplicity and follow the popular vase and foliage pattern (these are a little dissimilar to the pillar at Ajanta and Ellora). The plinths of these pillars are unusually wide — a common feature in all Jain temples of the period. The proximity to the Thar and its dry air has helped preserve the sharp details of the carvings over the ages. Adding to the entire ambience is the mesmerising sound of temple bells at dawn, announcing the time for prayers. As you enter the temples, you are met by the fragrance of sandalwood and the sound of rhythmic chanting in the air. You feel a sanctity and serenity of mind and heart that is little known outside the portals of the temples. Dressed in pristine white, the monks go about their daily chores, performing their assigned duties, undisturbed by the presence of the devotees and the pilgrims. The head monk is dressed in a red dhoti and a bright yellow shawl that distinguishes him from the other monks. With their mouths covered, a tradition which Jain monks follow strictly at all times, the prayers are said with many a devout Jain attending them regularly. Life here has not changed much through the centuries in contrast to the metamorphosis that the rest of the country has gone through. The Osian temples stand in their glory, as living proofs of the architectural marvel and the cultural ethos of yesteryears.